You may know Julia Child from her cooking, but few know that in 1960’s she was a secret agent for MI6. 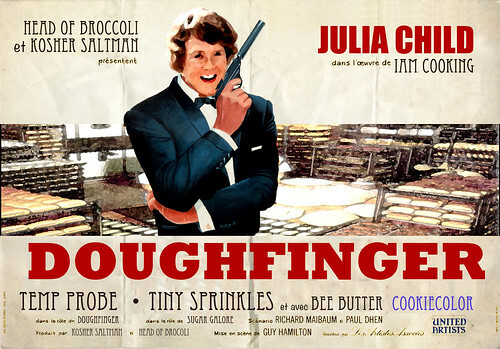 She was the only agent savvy enough to track down the culinary killer known as “Dough Finger” who would do his dirty deeds my covering his victims with a thin veneer pf pastry, effectively choking them in thin but tasty cookie shell. and that is how Daily Creates happen. This one was of course a bit involved, this is more in line with a regular ds106 assignment. But its good to mix up the pattern. I can think of no action hero more worthy to emulate than 007- but it was his catch phrased, Bond, James Bond, that fit fir Julia’s name. I wondered what take she would do on “Shaken Not Stirred”. A photo of Julia Child was easy to find, and a pit of the Dry Brush filter gave her head the cartoon look of the poster. The poster text I was not able to match the font exactly, but the Eccentric font was stylish enough for the title text of the credits, and I had fun playing with their names “Alfred Broccoli” became “Head Of Broccoli”, “Henry Saltzman” became “Kosher Saltman”.. Ian Fleming? “IAM Cooking”. TECHNICOLOR? become COOKIECOLOR. 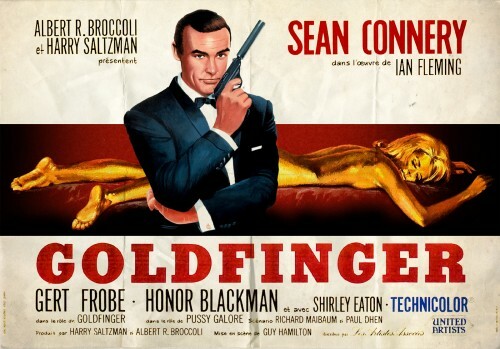 The Goldfinger title font turned out to be Rockwell, so that was easy to slide in. I did the usual clone brush on te background original poster. To replace the gold lady figure on the poster, I found a photo of a comercial bakery and pasted it in side a selection to fill the area behind bond/child, and then applied a paint daubs filter. It’s the details that count in a poster redo! This was fun, of course, it is ds106.